We don’t want to pigeonhole you, so – in your own words, can you tell our readers what you do and what you’re about. I write a blog called The Coventry Conch about growing up on the outskirts of the city in the 90s and early 00s. Sadly, you were unable to headline our July 2018 gig due to unforeseen circumstances. 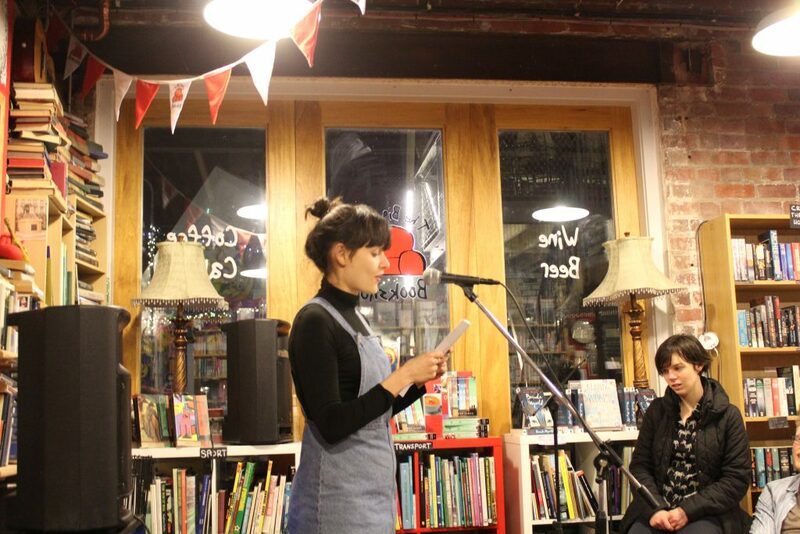 But we know your readings are very funny, as we’ve seen you perform live at Fire & Dust before. Does humour come naturally to you in most of your writing? I think so, I guess it’s the cliché of Tragedy + Time = Comedy. Most of my stories are pretty traumatic when you look at them: being bullied, throwing up at the school disco, being rejected by the boy I fancy. At the time it meant the end of the world to me, but when I look back those moments were ridiculous and often hilarious. How did the blog get started? When did you first realise that moments from your childhood were comedy gold and should be shared with the world? I did a comedy course a few years back, and the bloke teaching us said write about what you know, so I just started writing about hanging out with my Nan in the summer holidays when I was a kid. Nan had some pretty unique ways to keep us entertained, aside from letting us eat Pot Noodles for breakfast while watching the Sunset Beach omnibus, she used to take us on tours of recent house fires on nearby estates, and we’d guess what had caused them. I’d also help her out on car-boots – once she had a job lot of knickers that had the wrong sizes on. I was eleven, and spent the entire day trying to explain to old dears that it was actually a size 8 not a size 16 they were holding. Once I started writing about Nan, all the other characters and stories from my childhood started to creep in too and that’s kind of how it all started. If it’s okay to ask, are the Coventry Conch anecdotes completely true or do you find yourself exaggerating a little for comedic effect? The stories are inspired by real people and events but they’re often jumbled and obviously I can’t remember exact conversations and details. I try really hard to put myself back in those situations and imagine what might have been said at the time. Sometimes, I do feel like I’m hamming it up, but when (in real life) I bump into my Nan coming out of Ann Summers in town and my Grandad is on Fake Britain for his dodgy deals, I think I’m actually dumbing things down a bit. Who is your work aimed at – do you have an ideal audience in mind when you’re writing The Coventry Conch? I’d like to say something profound, like it’s for people on the outskirts who are underserved by the literary giants, and maybe there’s a bit of that, but mostly I’m just trying to have a laugh with it and hoping that others are too. Have you made any more Conch zines, and was that fun to do? I love making zines, it feels like sticking your fingers up at the mainstream. I’ve always got one in the pipeline but I’m a procrastination pro. On days I set aside for writing, I’ll Marie Kondo the whole house, make an elaborate lunch at 11am and watch the majority of This Morning – I do draw a line at Loose Women though. Do you have enough blog posts to publish as a collection, and is this something that’s on the cards? I think so, I’d love to publish a collection, but I’ve really got to pair all my socks and clean all the hair out of the shower trap first. 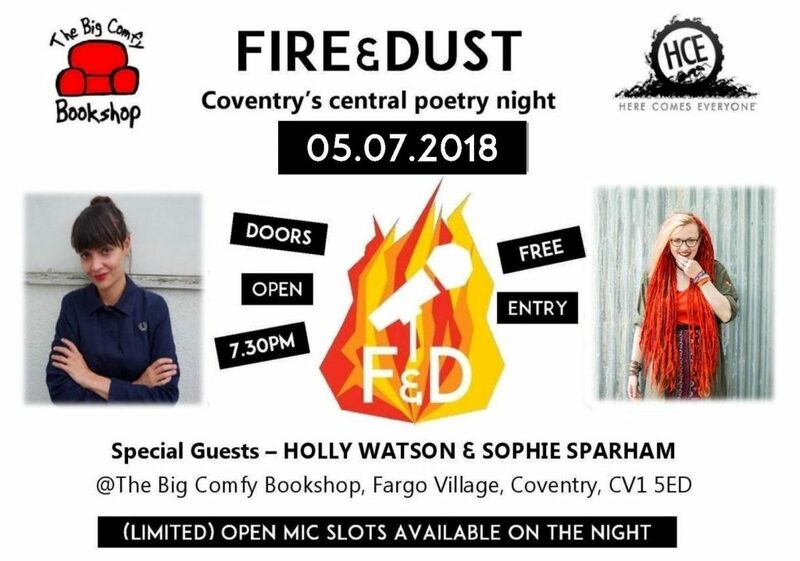 It was unusual for us to invite a non-poet headliner to Fire & Dust, but we knew how much the audience enjoyed your work last time. Do you perform at a lot of open mics/comedy gigs, and how is your material received? Some of the posts work better as spoken word so I do try and get out there as much as possible. I have found it hard to find the right audience I guess as my stuff doesn’t really sit in a traditional comedy or spoken word night setting. Nights like Fire and Dust are ace though as it’s a really supportive local crowd who seem open to anything.